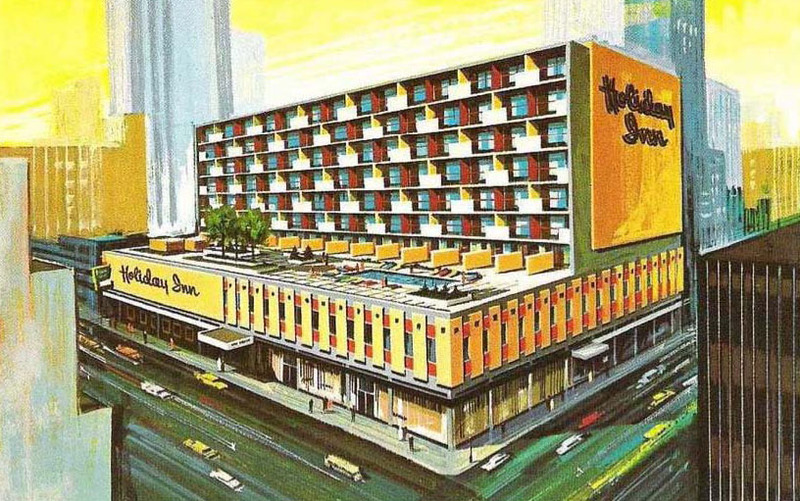 I came across this great postcard the other day of the Holiday Inn, built in 1964 and designed by the Calgary office of Rule, Wynn, Rule, the designers of the Calgary Trend House. The building has a lot of great modernist details in terms of it’s massing and the grid pattern of it’s facade etc. The neat thing you can see from the postcard is a view of the pool area, three stories above the street. The building was part of the Calgary Heritage Initiative’s Downtown MCM tour in October 2015, and is also a part of Calgary’s Inventory of Historic Resources. The building has special significance for me as well, as it’s the place where Jen and I first met in the early 80s at a Tiki-themed dance club called The Beach. You can see the marquee and the entrance just to the left of the Holiday Inn sign.